The Sky is the limit? Not for Antwerp Space. The Sky is the limit? Not for Antwerp Space. For them, it begins where the atmosphere ends. It is a fast-growing company with expertise in satellite communication. Their technology comes along on space missions to the far corners of our solar system. Antwerp Space produces high-tech products, but their original website had the look & feel of the 1990s. That's why their preference went to a fresh, modern website that still looks businesslike. They also wanted to spread their knowledge and atrract young people to hire. We strived for a website where they can easily post content, news and vacancies. A company with state-of-the-art technology? Well, that can't have a dated website. Not only did we provide a website with a modern look, but also a useful information structure. That way visitors can easily find their way through the website. We also developed icons in the style of Antwerp Space, so we gave the web pages personality. We also made the website responsive for mobile devices. The website is therefore presentable on any medium: laptop, smartphone and tablet. 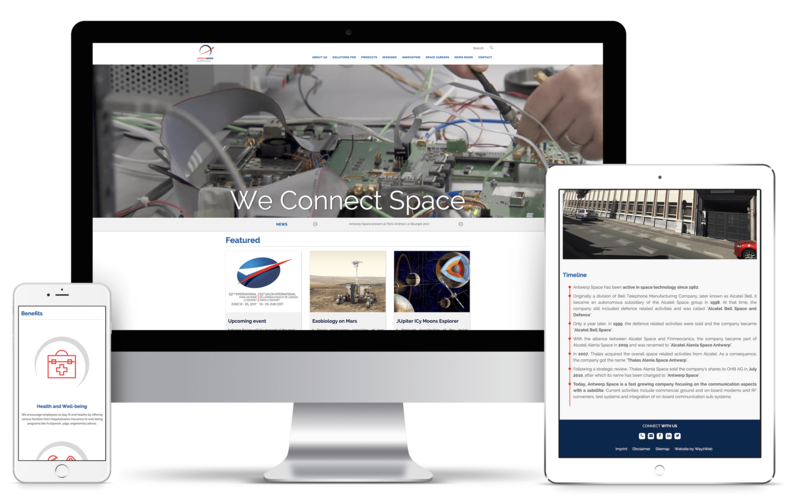 “Houston, we have lift off!” We achieved the intended result within the set time: a new website that's fresh and modern, yet still looks professional and professional. In addition, we have linked the website to our Yes-cms, which means that the customer can easily adjust the website at any time. Blogs, news, vacancies: everything can appear smoothly and in no time at all.